The first learning event of the thematic working group on technological innovation (1) of the national platform on land and water management took place on 6 December 2012. The event brought together representatives from the Amhara Regional Agricultural Research Institute (ARARI), the Water and Land Resource Center, Nile river basin authorities, the Ethiopian water harvesting association (ERHA), and the Swiss Agency for Development and Cooperation. All participants were invited to discover and test the new open source geographic information system (GIS) tool for suitability mapping “Nile-Goblet” and to ponder how to bring technical innovation on the ground. The participants liked the tool very much, for its ease to make suitability maps without prior GIS knowledge. They also appreciated the fact that the tool allows anyone to introduce their technical expertise or local knowledge about suitability criteria following a very a transparent procedure. Subsequently, policy-makers and practitioners can identify with, understand and trust the resulting maps. The tool is expected to emphasize the necessity to promote location-specific rainwater management and to help move away from today’s one-size-fits-all blanket approaches. Indeed, the maps generated by users can support the elaboration of context-specific policies. In combination with participatory approaches such as the Happy Strategies game, the maps also allow bringing in expert knowledge into a participatory approach and improving planning on the ground, together with communities. Participants of the learning event found it very useful to come together to learn and discuss. It is likely that this group will meet again and possibly combine learning events with other events that are already planned and funded. Additionally, the Water and Land Resource Center – in collaboration with the Swiss Agency for Development and Cooperation – will look into opportunities to use and promote the Nile-Goblet tool for their own work. On the second day of the workshop, an informal training course took place, aiming at adapting the tool for participants’ own needs. The learning event brought together a budding community of practice which seems truly interested in location-specific rainwater management and has the capacity to carry out the work of the Nile Basin Development Challenge in this field further along. On 18 December 2012, the learning event was followed by another introduction to the Nile-Goblet tool, this time for CGIAR staff in Ethiopia. Read the notes of the Learning Event here. Read more about the Nile-Goblet tool here. (1) The national platform on land and water management launched four thematic working groups in the course of 2012. Technological innovation is one of these working groups. 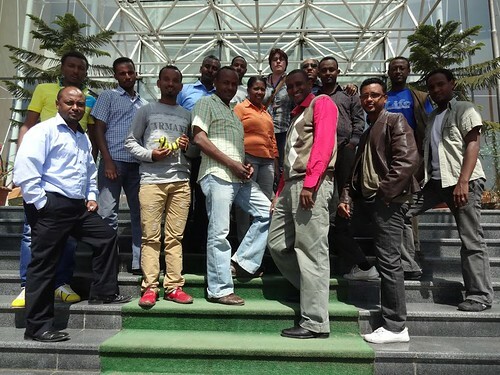 The Nile 3 project ‘Targeting and scaling out of rainwater management systems‘ recently organized two training courses on geographic information systems (GIS) for its partners – in Addis Ababa and in Gondar. The objective was to teach and test the beta version of the new Nile Goblet tool. This open source GIS solution helps users carry out suitability mapping without prior GIS knowledge. 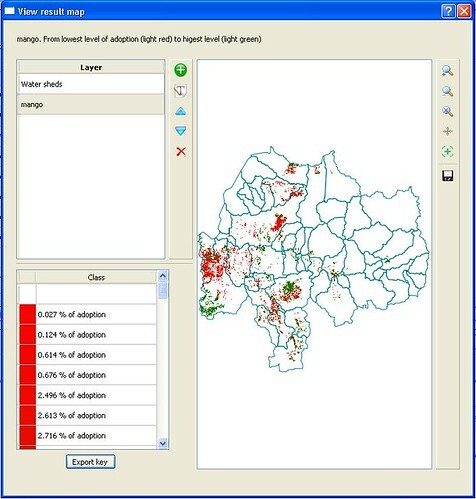 Based on the concept of rainwater management developed in the Nile Basin Development Challenge, the tool allows users to define their own suitability ranges for a whole range of bio-physical criteria to map suitability of various rainwater management practices. In addition, it makes use of so called “willingness of adoption” maps to introduce the socio-economic constraints into classic suitability analysis. Finally, to improve water availability and productivity, rainwater management practices should be combined at landscape scale. Therefore the tool includes a module that helps study suitability of a combination of rainwater management practices at landscape scale. The tool is flexible and can be programmed for any practice/technology and any location in the world, as long as geographical layers for the different suitability criteria are available. 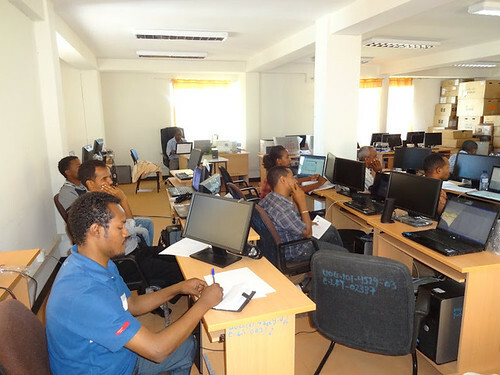 Part of the training consisted in preparing new layers both in ArcGIS and in GRASS GIS (an open source GIS software) and introduce them to the Nile Goblet tool. Both training courses were a success. Participants could learn about suitability mapping as well as the challenges one might face when preparing new geographical layers for the tool. The training courses served as a way to test the tool. Minor technical itches could be identified and a great number of suggestions for improvement were collected. The team is now working on an improved version, hoping to launch the tool at an upcoming learning event from the innovation and technology thematic working group of the national platform and give an additional training for CGIAR scientists based on the ILRI Ethiopia campus. Read more information about the Nile Goblet tool.